We've just released a new version of the virus database for iAntiVirus. If you haven't got Smart Update set to automatic then please run it manually to ensure you have the latest protection available! 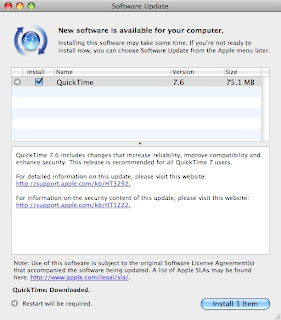 Apple has released an update for QuickTime, amongst the changes are security fixes. Please run Apple Software Update to get it! This update addresses heap overflows, buffer overflows, memory corruption issues and others - all of which may lead to arbitrary code execution. iAntiVirus v1.3 has passed testing and is now available! You can grab it from here or run a Smart Update to upgrade. Changes in this version have been mentioned in a previous post.